This looks like some kind of waterbird. The legs are too spindly for any duck, goose, swan, grebe or loon, too short for a heron (except bitterns) or ibis, and too long for a gull or tern. Bitterns have fairly short legs but have a different upperpart pattern and not as much rear end as our quiz bird. Rails are barred on the sides and gallinules aren't as white below as our bird. The body shape and posture do suggest a sandpiper of some kind. The upperparts of our quiz bird are too dark and plain for almost all sandpipers except Solitary Sandpiper, which is what this bird is. 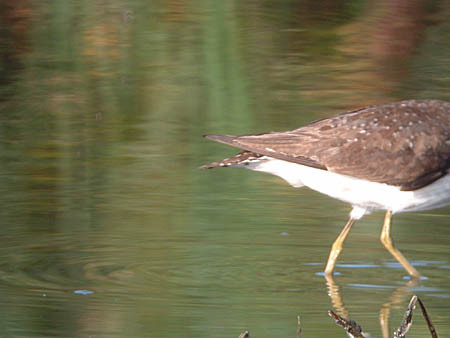 This headless Solitary Sandpiper was photographed in Kankakee County on August 9, 2003.